The Greenville Public Library is proud to host Jim "Pee Wee" Martin to share his experiences in an effort to promote and preserve the legacy and lessons of the Second World War. This free event will be held at the Henry St. Clair Memorial Hall on Saturday April 21st from 1:00 to 2:00 p.m. All ages welcome! 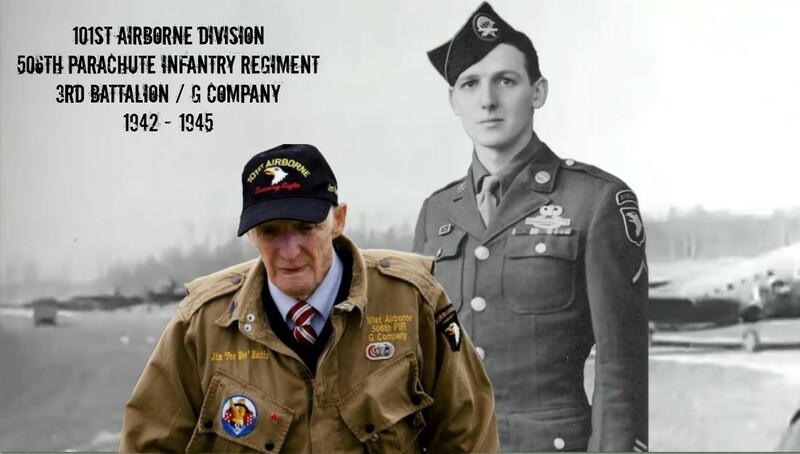 Jim was a member of the 506th Parachute Infantry Regiment, 101st Airborne Division, 3rd Battalion, G Company, from 1942 to 1945. These men went through intense training at Camp Toccoa, Georgia, where the 506th was formed, an elite company consisting of 140 men and seven officers. Known as the "Toccoa Originals" they were made famous by the book Band of Brothers by historian Stephen Ambrose which was later made into the HBO mini-series. Their harrowing story began the night before D-Day, June 6th 1944, when they parachuted over Normandy and touched down in enemy-controlled territory behind Utah Beach. They fought for 43 days as part of the Normandy campaign before moving on to invade Holland, fending off Nazi fighters during the Battle of the Bulge, and finishing off by taking Berchtesgaden, site of Hitler's "Eagle's Nest" redoubt in the German Alps. On June 6th, 2014, the 70th anniversary of D-Day, Jim became the last WWII era American paratrooper to jump over Normandy at the age of 93. He landed behind Utah Beach just as he had 70 years earlier. He felt fine after the jump and reportedly said "It didn't compare because there wasn't anybody shooting at me today." During the commemorations Jim was fortunate to meet several of the actors involved in HBO’s “Band of Brothers” series. He has said on many occasions that he holds all of these men in high regard. Jim considers them to have brought attention to the legacy of WWII. While attending the wreath laying ceremony at the Winters Leadership Memorial near Sainte Marie du Mont, Jim had a completely unexpected conversation with the British actor Damian Lewis. Lewis portrayed Maj. Richard Winters in the series. Damian asked Jim about his experiences from Toccoa through Bavaria and spoke about his experiences during the production of “Band of Brothers”. This unexpected encounter was a special moment for Jim. A Q&A and picture opportunities will follow the presentation!